Laburnum Boat Club have narrowboats, canoes and kayaks that you can use. You can go on a narrow boat trip along the Grand Union canal or go paddling in a canoe or kayak. You can bring your own lunches to eat at the boat centre, on the boat or stop and eat at a park. There is a ramp for people using a wheelchair to get onto the narrow boat and a lift inside the boat - it is very safe. The narrow boat has a small accessible toilet. A member of staff can support you to steer the boat. The narrow boat trips are return trips. 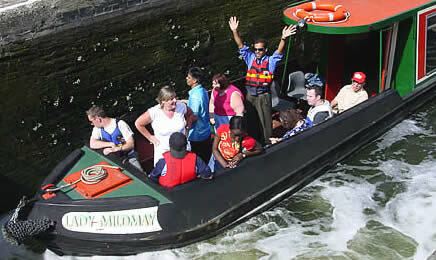 Up to 12 people can go on a narrow boat trip. If you use a kayak or a canoe a member of staff will support you. You can go in a kayak by yourself or with another person. If you want to you can use a hoist to get into the canoes and kayaks. Staff give everyone a buoyancy aid to wear. You should bring a change of clothes and a towel with you. Laburnum have clubs and events each week. For more information phone the booking line. There is an adult club on Wednesday night from 7.30 p.m. - 9.30 p.m.
You should book a canal boat trip well in advance, they are very popular. A half day narrow boat trip starts at £40.00 you can book longer trips. To go canoeing by yourself costs £1.00 or £2.00 each for a group booking. Laburnum Boat Club is by the Mosque and next to Laburnum school. There are a few accessible parking spaces, it's a good idea to book a space. There is blue badge parking and pay and display parking outside on the street. Nearest Mobility buses: 26 277 236 276 W15. Standard buses: 243, 149, 242, 243, 67. Old Street underground station - not accessible for wheelchair users. The underground station is about 1825 metres from the Laburnum Boat Club. Dalston Kingsland station is about 1750 metres from Laburnum Boat Club. The footpaths along Laburnum street don't have drop curves so people using a wheelchair may be better travelling along the road. There is plenty of room for a person using a wheelchair to move around outside and inside the Laburnum Boat Club. There are 2 buildings at the Laburnum Boat Club, the Office and Classroom building and the Boat Club Hut. There is a fully accessible toilet here. The main entrance doorway is 805 mm wide. There is a ramp to the doorway, if you are using a manual wheelchair you may need support. This is where you can get ready to go on a boat. There is a ramp to the main doorway, it is 1040 mm wide. The ramp can be quite steep but there are people there to help you, there is a rail on both sides. The main entrance doorway is 1110 mm wide. You can use the shower, it does not have hand rails and there is a small step of 135 mm to get into it. The toilet here is not adapted. There is a fully accessible toilet in the Office and Classroom building. Minimum door widths are 805 mm. There is always staff around, they are really friendly and helpful.